For the first time in history, a woman is the leading candidate for the presidential nomination of a major U.S. political party. As Democrat Hillary Clinton wages her campaign to be the first female chief executive, what do Americans have to say in general about the prospects and qualifications of female candidates for high political offices? 1 Women in our survey said men had an easier path to political leadership, and they also were more likely to say that having more female leaders would improve the quality of life for women. 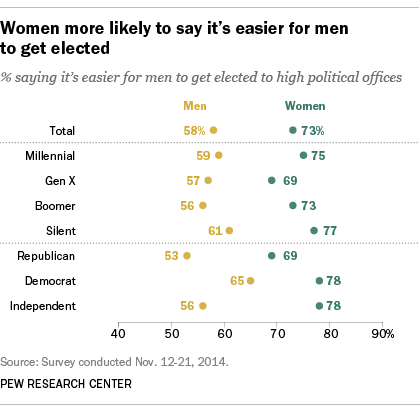 About three-quarters (73%) of women said it’s easier for men to get elected to high political office, while 58% of men agreed. And 38% of women said that having more women in top political or business leadership positions would improve the quality of life for all women “a lot.” Only half as many men (19%) agreed. There were similar differences by political party on this question, with more than twice as many Democrats (39%) as Republicans (17%) saying that having more women in high political office would improve the lives of women, while independents (28%) ranked in the middle. 2 In 2015, there were 104 women in Congress, a record number representing 19% of all Senate and House seats. 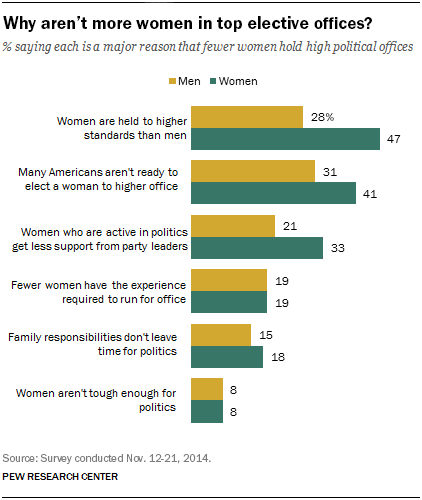 There was no overall consensus among the public in our survey on what holds women back from gaining top elective offices, though women were far more likely than men to cite societal and institutional factors as major reasons. About half (47%) of women said that a major reason there are not more women in top political offices is that female candidates are held to higher standards than men, compared with 28% of men who said so. Four-in-ten women (41%), compared with three-in-ten men (31%), said that a major reason for the lack of women in top political offices is that many Americans aren’t ready to elect a woman to a higher office. And 33% of women, compared with 21% of men, said that females getting less support from party leaders is a major reason. Relatively small shares of men (15%) and women (18%) said that family responsibilities are a major reason that fewer women hold elective offices. 3 There was a wide and consistent gender gap in opinions about the relative strengths of male and female political leaders on five attributes tested in our survey, though most men and women said there is no gender difference on these traits. One of the largest gender gaps was on the ability to work out compromises: 41% of women compared with 27% of men said women are better at this. 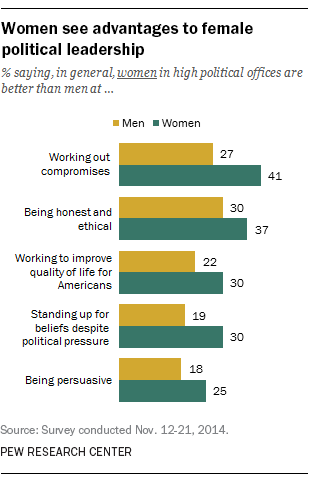 Women also were more likely than men to say female leaders surpass men in being honest and ethical, working to improve quality of life for Americans, standing up for their beliefs despite political pressure, and being persuasive. The survey also asked about gender differences among leaders on various policy issues, and found less-pronounced differences among male and female respondents. 4There were generational differences among women in our survey on the attributes that a woman brings to political office. Younger women were less likely to give female leaders an edge over male leaders, and instead were more likely to say men and women are equally likely to possess certain traits. For example, when it comes to working out compromises, 33% of Millennial women and 37% of Generation X women said women are better than men, compared with about half of women from the Baby Boomer (47%) and Silent (50%) generations who said so. Asked about which gender is better at working to improve Americans’ quality of life, only 22% of Millennial women and 24% of Gen X women said female leaders are better, compared with 39% of Baby Boomer women and 35% of Silent generation women who said so. 5 In November 2014, before Clinton had declared her candidacy, Democrats were more enthused than Republicans about a potential female president. This partisan difference was bigger than the gender difference among survey respondents. Our survey question asked people whether they hoped a female president will be elected in their lifetime, or whether that did not matter to them. For many, the prospect of a Clinton presidency may have influenced their responses to this “hypothetical” question. Democratic women (69%) were the most likely to say they hoped a female U.S. president would be elected in their lifetimes, followed by Democratic men (46%) and independent women (45%). Among Republicans, fewer women (20%) and men (16%) said they hoped for this, as did about a third (32%) of independent men.